This month, we decided to highlight one of our favorite local charities so we could help spread the word! We were able to interview Jeanne Bresett, owner and facilitator of this organization to get her take on what Gram’s Goodies accomplishes for the community. The Gram’s Goodies mission is to encourage and empower people affected by life’s storms by putting God’s love into action and enrich lives with hope, peace, strength, and joy. What we do: We partner with Birthday Angels, another non-profit group, by making and donating cupcakes for their monthly birthday parties for children that have been abandoned and live in homeless shelters. Our very own Amanda makes all the cupcakes and cakes and has provided all of the purchases and labor herself. We make homemade meals and deliver to families and/or individuals that may have a serious, often terminal, illness, to persons who dealing with a recent death in the family, really for any reason we feel led to do so. Once in awhile, we have been able to also celebrate the joy of a child born, or some other wonderful life event and provide a meal for them too. I make select canned goods such as guava jam, mango jam, strawberry jam, pickled okra, pepper relish, homemade soaps, crafts and have received nominal donations for these items to help sustain us temporarily. We also give canned goods, (whatever is in season) with the meals we provide. The fruits and vegetables used in the canned goods are bought from local vegetable stands (Kroegel Homestead), Countryside Citrus, and homegrown! We want to stay connected with the hometown local businesses as well. Personally, I perform wedding ceremonies and have done a few funerals. I donate this time as well for Gram’s Goodies benefit. My husband Scott does handy man work and we are incorporating his services and abilities into our business as well. We established our LLC faith based-family business earlier this year, even though we have been serving people in this way for several years. Amanda’s husband Branden has donated monetarily a few times to help sustain us as well, we have supported Gram’s so far by our own income. Thank you for your interest and have a great day! With love, Jeanne Bresett. 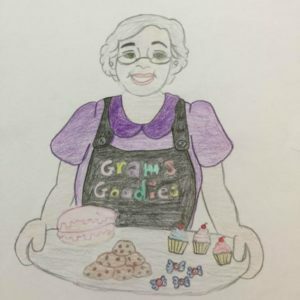 If you’d like to learn more about Gram’s Goodies and help support these local angles, please visit and like their Facebook page so we can spread the word!